In order to write an article about renowned Zen master Tanchu Terayama’s Hitsuzendo calligraphy exhibition, I was offered the rare opportunity to visit his mountain retreat in Ibaraki Prefecture to participate in a workshop with Terayama himself. I first got a call from Terayama’s most dedicated student, Sarah Moate, an Oxford art history graduate from Britain and the only foreigner displaying work in the exhibition, who suggested I attend one of her lessons as an introduction to Terayama’s teachings. Like the master, she holds an inka (certificate of enlightenment), and is qualified to teach Zen calligraphy. I’m not an 8 a.m. Saturday morning kind of learner, but was consoled by the thrilling prospect of being instructed in the subtle art of shodo — brushwork kanji. The next morning, before getting anywhere near paper and a brush, I found myself with two other students barefoot in the grass, following Moate as she led us through exercises where we stretched, shouted and gasped. In one exercise, she raised her hands and softly swayed in the air, making the shape of the character mu (nothing). We repeated the motion over and over, first with our arms, then with our bodies, arching to the right and then slumping over lifelessly, exhaling with the last kinetic “stroke.” What did all this have to do with calligraphy? Terayama’s teachings of Hitsuzendo (The Way of the Zen Brush) were inspired by a lineage of Zen greats beginning with Yamaoka Tesshu in the late 1800s, who sought to elevate calligraphy above a fine art form to a spiritual tool for focusing the mind. 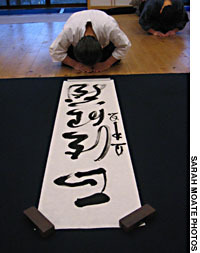 What makes Hitsuzendo unique is that it eschews the methods of calligraphy prevalent everywhere. This focus was apparent at the dojo when were were first asked to practice by painting kanji on sheets of newspaper. Each piece was whisked away as soon as the brush was lifted off the paper, then folded and stacked on to a pile to be discarded. “The idea is, nothing is precious,” Moate explained. If the quality of the line reveals the inner person, my inner person was clumpy, uneven and prone to sailing off the paper. Yet Terayama had nothing but praise for me, saying that the characters were strong, and that I did a great job holding my brush softly. “Soft but strong, you can’t get much better than that!” Moate whispered. Such an encouraging approach, and handy English translation, makes it hardly a surprise the workshop is popular with foreigners. 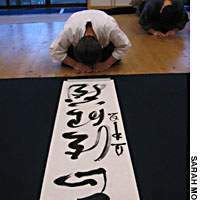 Terayama, a Rinzai Zen master, has taught more than 250 students from 10 countries, and the English translation of his book “Zen Brushwork: Focusing the Mind With Calligraphy and Painting,” (Kodansha) is widely available. Aiming for as broad an appeal as possible, the book includes black-and-white photographs of Terayama and Moate practicing the ki (vital energy) exercises in addition to a calligraphy how-to and an appreciation of work by ancient Zen masters who have influenced Hitsuzendo. Moate started her search for for a master after receiving her inka, which is the highest honor you can receive from a teacher, it also represents the permission for you to become one. Throughout her six years of study, Terayama and Moate have often traveled to Europe and the United States together sharing Hitsuzendo with groups who gather from various parts of the world eager to experience the workshops and exhibitions. The exhibition will consist of an assortment of work from students ranging in age from 20 to 97 years old. It also boasts some museum-worthy relics from Terayama’s personal collection. One is a piece by Ekaku Hakuin (1685-1765). Terayama calls Hakuin the most influential Zen monk of the past 500 years. A prolific artist who produced over 1000 brush paintings and calligraphy during his lifetime, Hakuin was one of the first to develop breathing and exercise techniques to aid the study of Zen. The piece is called “Settled” and reads: “Fix yourself in the best place. Know exactly where to stop.” It was painted in 1765 and is one of Hakuin’s most revered works. “These are the kinds of treasures that people keep hidden in temples and are only revealed at certain times of the year,” Moate says. “It would be like seeing an original Leonardo [da Vinci], first-hand, not behind glass.” Hakuin was 80 years old when he created the piece. It is fitting since the age of the contributors is one of the most striking aspects of this exhibition. Shown alongside the work of his students, Terayama has assembled calligraphy and paintings from many guests — all of whom are over 80 years old. “Older people are more aware of the links between the things in the natural world,” Terayama said. The master won’t have much of his own work in the show. He said he will wait a few more years for his 70th birthday, as exhibitions could become distractions that will take over his world. For now, this one will suffice. “All I really hope for is that people will see it and leave the exhibition feeling healthy and more uplifted,” says Terayama. And as the master himself will be on hand to discuss the work, visitors may even find the experience enlightening.